Safely store and preserve all those irreplaceable mementoes from the precious wedding day. Makes a great wedding gift. What is included in the Wedding Box Pack? This pack contains 5 Acid Free * Storage Boxes and much more. Fits A3-size papers. You could your wedding scrapbook or a photo album. 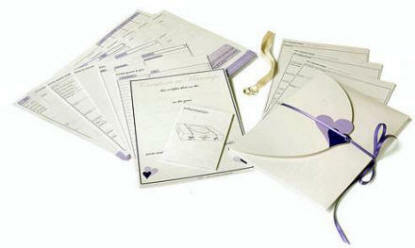 A4 size box perfect for congratulations cards, certificates, invitations, special cards and collectables. For mementoes, keepsakes, cards, home-shot DVDs and so on. The right size for standard photographs, tapes and other easily-mislaid items. To prevent small items getting lost and forgotten. * The Wedding Box collection meets international standards: ISO 9706: 1994 (Paper for Documents – Requirements for Permanence); ISO 14523: 1999 (Photographic Activity Test for enclosure materials) or Technical Association of the Pulp and Paper Industry T509 and T529 (surface pH measurement of paper).